This prostrate, evergreen plant forms a neat carpet of lance-shaped, dark green leaves - excellent for suppressing weeds in sun or partial shade. 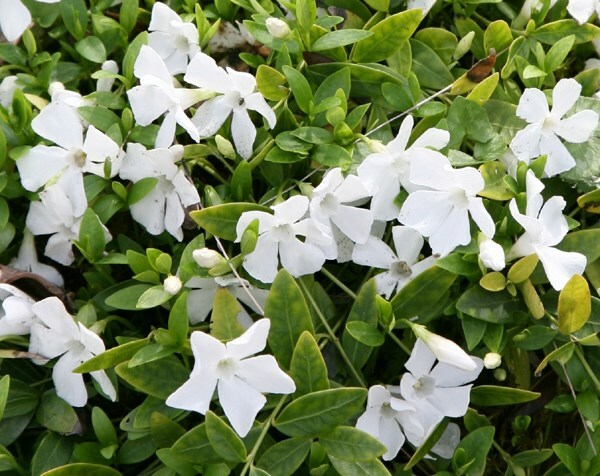 The wonderful, pure-white flowers - borne over a long period from April to September - are valuable for lightening dark areas. More compact than other varieties, it's perfect where space is limited. Good plant and size. Has grown really well and coped with the winter. Hello Anna, Ideally you should dig in as much composted organic matter as possible to enrich the soil before you plant, and then (if you don't mind plants spilling out from the border), you could plant any of the following. Lavandula, Hebe, Hypericum or Vinca. Which plants are Deer proof? I want a list of Deer proof plants please. It`s either a change in habitat or environment, but I get total devastation now and in the last two years they come up the drive. Deer can be a real problem and deer proof plants are usually thorny, poisonous or simply taste awful, but it is hard to give a definitive list as you might get the odd deer with unusual tastes which might like the bitter taste! Below is a list of good plants that generally are quite successful though. Cornus varieties, Rhus, Sophora, Solanum, Berberis, Rosemary, Buxus, Cotoneaster, Ilex, Pyracantha, Garrya, Juniperus, Nandina, Elaeagnus, Aralia, Aucuba, Cortaderia, Yucca, Santolina, Hypericum, Myrtle, Vinca, Achillea, Digitalis, Echinacea and Dryopteris. Finally, fencing is one method to protect garden crops from deer. Since deer jump, you need an 8-foot fence for best results or stout chicken-wire fencing securely around smaller garden plots. Alternatively, fence the area with a thorny shrub, preferably something that will grow to at least 6 feet. Deer eat roses and some thorns but hawthorn, boxwood and holly will exclude them. Deer are also deterred by dogs, hanging aluminum foil, mirrors, wood that hits objects in the wind and other noise-makers. Some old-fashioned repellents are human hair and blood and bonemeal. Hanging bars of fragrant deodorant soap from branches may work. Other well-known deer repellents are mothballs or moth flakes spread on the ground or put in mesh bags for hanging in a tree. Unfortunately though, no repellent is 100 percent effective, especially if the deer population is high and deer are starving. What can I plant that the deers won't eat? What types of plants do deer not like? If you could help me out I could greatly appreciate it. Deer can be a real problem and deer proof plants are usually thorny, poisonous or simply taste awful. It is hard to give a definitive list as you might get the odd deer with unusual taste which might like a bitter taste, but the following is a list of plants that generally are quite successful. Cornus varieties, Rhus, Sophora, Solanum, Berberis, Rosemary, Buxus, Cotoneaster, Ilex, Pyracantha, Garrya, Juniperus, Nandina, Eleagnus, Aralia, Aucuba, Cortaderia, Yucca, Santolina, Hypericum, Myrtle, Vinca, Achillea, Digitalis, Echinacea and Dryopteris. Finally fencing is one method to protect garden crops from deer. Since deer jump, you need an 8-foot fence for best results or stout chicken-wire fencing securely around smaller garden plots. Alternatively, fence the area with a thorny shrub, preferably something that will grow to at least 6 feet. Deer do eat roses and some other thorns but hawthorn, boxwood and holly tend to keep them out. Deer are also deterred by dogs, hanging aluminum foil, mirrors, wood that hits objects in the wind and other noise-makers. Some old-fashioned repellents are human hair and blood and bonemeal. Hanging bars of fragrant deodorant soap from branches may work. Other well-known deer repellents are mothballs or moth flakes spread on the ground or put in mesh bags for hanging in a tree. Unfortunately though, no repellent is 100 percent effective, especially if the deer population is high and deer are starving.